When soloists unite, bringing their talents to an exciting repertoire with an acclaimed violinist as front-man, fireworks ignite. This exciting new ensemble, International Chamber Soloists with violinist Dmitri Berlinsky, is acclaimed for its interpretative skill and its on-stage pyrotechnics. This unique group of extraordinary young string players hail from literally the world over. Comprised of young, award-winning musicians from the U.S., Russia, Poland, Belarus, Romania, Korea, Taiwan, New Zealand, Australia and Uzbekistan, they are united through their love of and dedication to music. Recent engagements include performances on both coasts (including festivals in New York and a debut in Los Angeles), a Canadian debut (Toronto and Barrie, Ontario), appearances in Florida, Maryland, Virginia, Washington, DC, Kansas, Michigan, and a tour of Colorado, Iowa, Minnesota, New Mexico, Nebraska, North Dakota, South Dakota and Wisconsin. Attracting the highest caliber instrumentalists from around the world, Dmitri Berlinsky has created a superb ensemble of dynamic and fiercely talented musicians. 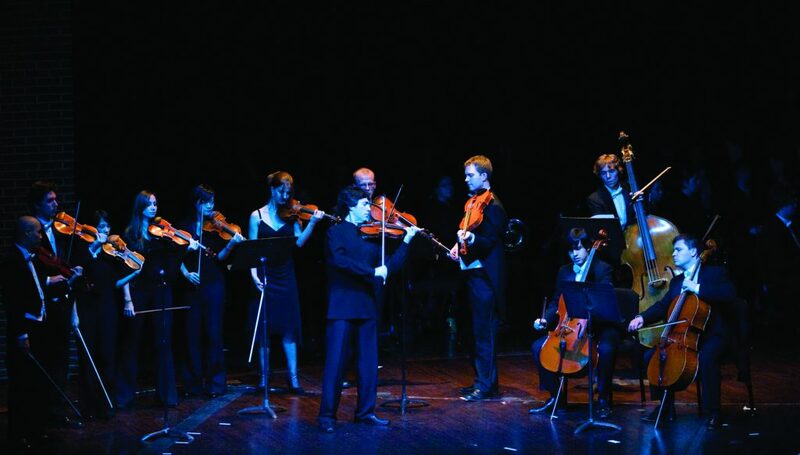 Just after its formation, the International Chamber Soloists opened the 15th International Credomatic Music Festival in San José, Costa Rica, made an appearance at the Fontana Chamber Arts Festival, and performances in such distinguished venues as the Wharton Center and the San Francisco Conservatory. Berlinsky moved from Russia to New York as a winner of the Young Concert Artists Auditions, while already distinguished as the youngest winner in the history of the Paganini International Violin Competition in Genoa. He then made subsequent triumphs at the Montreal International Violin Competition (Grand Prize), the International Tchaikovsky Competition and the Queen Elizabeth Competition in Brussels. Through his international travels as soloist with major orchestras in US, Europe, Latin America, Asia and Australia, it was Dmitri Berlinsky’s dream to find an environment in which to establish a chamber orchestra where his colleague-friends could find inspiration and realize the joy of playing together. And with their support he would be able to achieve his highest artistic vision as a violin soloist. A new CD including the Piazzolla Seasons is scheduled for imminent release. “Berlinsky led off playing J. S. Bach’s famed Violin Concerto No. 1 in A minor, BWV 1041, surrounded by the 11-person International Chamber Soloists of which he is music director. The resulting glorious sound hinted that Bach’s writings, many composed for religious venues, miraculously accommodated the resonating acoustics found in most churches like St. Luke’s. That factor proved welcome.